Transporting glucose and oxygen into your muscles. Serving as a critical component of your brain, blood, muscles, and bones. Aiding digestion of food, helping to convert it to energy you can use. Removing metabolic byproducts like carbon dioxide from your hard-working muscles. Regulating body temperature, especially during your workouts when your muscles generate 20 times more heat energy than a body at rest. The bottom line is that dehydration can have a significant effect on performance. Anyone, from runners to lifters, can become dehydrated if fluid loss is greater than fluid intake. It’s as simple as that. And dehydration can lead to reduced performance, headaches, fatigue, and muscle cramps. Additionally, when thinking about hydration, it’s important to remember that water isn’t the only way to get the necessary fluids. Christman reminds people that hydration can come from other beverages, such as tea and coffee, and from fruits and vegetables. So, depending on what you’re eating throughout the day, you don’t need to rely solely on chugging water to stay hydrated. Hydration during sedentary activities — such as sitting at your desk at work or having an outdoor picnic — is the best way to put the hydration basics to use. In these cases, you aren’t going to be sweating and losing sodium like you would while performing vigorous physical activity, so you don’t need to add much to the basics to stay within healthy levels. The exception is if it’s unusually hot outdoors and you’re losing water and sodium through sweat. As you are going through the day, keeping track of how much fluid you are consuming (like through Livestrong.com’s MyWater app) in is an option, but most people can measure their hydration levels through thirst and urination. A good rule of thumb to remember is that if you’re feeling thirsty, it’s possible you’re already dehydrated. It’s important to not wait until you’re dying of thirst to drink water, but you also shouldn’t let this guideline frighten you into drinking too much water, which can result in hyperhydration and a diluting of your blood. Another important thing Turner stresses during sedentary activity is that thirst can be mistaken for hunger, causing people to overeat. If you’re drinking water throughout the day, not just when you’re thirsty, it can help eliminate overeating or unnecessary snacking. If you’re exercising, your hydration routine will be much different than your normal routine. It’s important to go into exercise hydrated, so drinking water regularly is still just as important as hydrating throughout your workout. Christman agrees with this and adds that sports drinks are most appropriate for those exercising intensely for over an hour, working outside in the heat or for elite athletes to replenish glycogen stores, electrolytes and optimize performance. She recommends the American College of Sports Medicine (ACSM) guidelines when it comes to exercise and hydration. 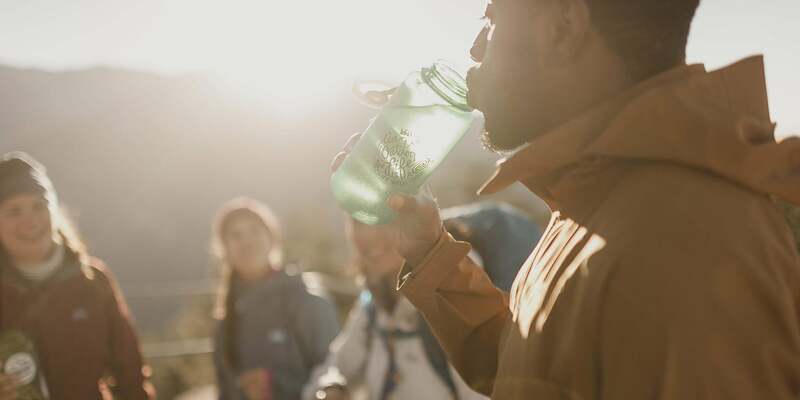 “According to the ACSM, to maintain hydration during exercise drink 16 to 20 fluid ounces of water or sports beverage at least four hours before and eight to 12 fluid ounces of water 10 to 15 minutes before exercise,” Christman says. “During exercise, drink three to eight fluid ounces of water every 15 to 20 minutes when exercising for less than 60 minutes, or drink three to eight fluid ounces of a sports beverage every 15 to 20 minutes when exercising for longer than 60 minutes.” After exercise, you should check your body weight (as explained above) and urine color and correct your losses within two hours after exercise. “Drink 20 to 24 fluid ounces of water or sports beverage for every one pound lost,” she says. Christman also stresses discussing any questions you may have regarding ideal hydration levels with your health care provider, because there are certain medical conditions that warrant fluid restrictions. If you’re living a busy life, even simple tasks–like staying hydrated–can be difficult. So here are seven easy ways to keep your juices flowing. 1. Fruits and vegetables are great sources of water. Be sure to eat these daily, not only to stay hydrated, but to maintain optimal health. 2. Keep a large water bottle handy to encourage you to drink water wherever and whenever. 3. Have a glass of water before each meal. 4. After each trip to the restroom, drink a glass of water to replenish your fluids. 5. Set reminders on your phone, watch, or email to drink every hour. 6. Track your intake of fluids to make sure you get enough daily. 7. Add a slice of lemon, lime and/or basil to your water to give it some flavor without adding any extra calories.